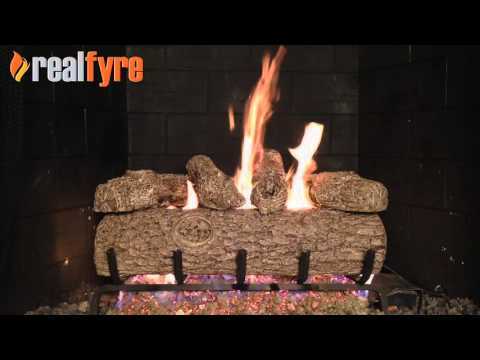 Peterson Real Fyre Classic Series Gas Logs have withstood the test of time with traditional favorites, like the Golden Oak, and by utilizing the most innovative technologies to help safeguard the environment. Their attention to log detail, log texture and flame presentation produce elegant fireplace displays that fill any room with comfort and beauty. This Peterson Real Fyre gas log set includes: Ceramic Refractory Vented Gas Logs, ANSI Certified Vented Burner with Pre-Assembled Valve and Regulator, Piezo Ignitor, Custom Grate, Connector Kit, Glowing Embers, Vermiculite, Burner Clips, and Damper Clamp. The Peterson Real Fyre Vented ANSI Certified G46 Burner features a T-shaped burner pipe. 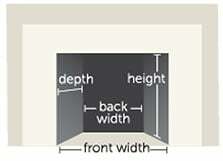 The T-shaped burner contains a large pipe in the center of the pan and a smaller pipe that runs through the ember bed. This allows the flames to not only dance through the center of your log set, but through the center of the ember bed, which gives you a more realistic flame pattern. This burner also contains a patented system that features a hidden factory installed control valve, and piezo ignition at the rear of the burner. It has a BTU output of 40,000 BTUs. This set features a basic on/off safety pilot valve that is operated by on/off switch or the included remote control. The ANSI Certified G46 Burner is available with all Peterson valve controls with or without remote controls and in multiple size sets.